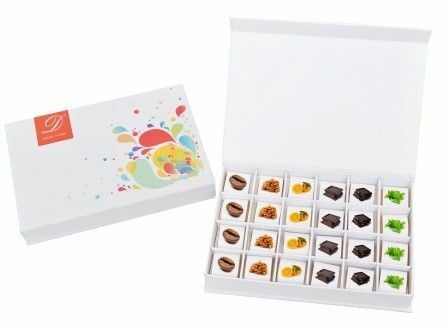 The luscious and bumper pack of 24 Dark Ivory chocolates finely arranged in a perfectly crafted white colored box with a colorful splash will make for a memorable gift this season. Each bar is designed infusing delightful flavors and irresistible chocolate layers. The freshness of plain, butter-scotch, mint, pungent orange, crunchy crackle and enticing coffee will pamper everyone's taste buds.